I found a photo of one of the Banksias to update this post. Banksia praemorsa is a good hardy plant which has a few different colour forms. My favourite is a wine coloured form which I do not see very often. These Banksias seem to grow quite well in alkaline soils with good drainage. If plants seem unthrifty I try some agricultural sulphur, a cupful to the square metre, watered in because the soil here is highly alkaline. Failing that, some iron sulphate, or iron chelates (following packet directions). Good garden practice would see lots of organic matter going into the soil which would lower the pH a little over a period of time. Some of these are in this list because of anecdotal evidence that they will grow in alkaline soil. More will probably be added as they are trialed by folk willing to have a try with the species. 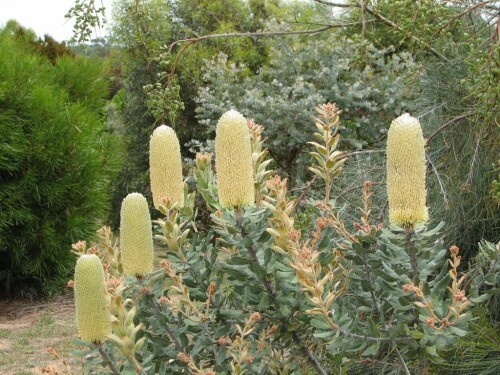 Thanks for this very useful information about banksias and alkaline soils. Our garden on Kangaroo Island already has B. marginata, B. integrifolia, B. media, B. ornata, B. praemorsa and B. prionotes, but I’m now going to try some of the others. I’ve just discovered this excellent blog/website – cheers. Great information—–no wonder mine have not done so well. I have found that B.Menziesii dwarf,will grow on high ph if very well drained. also speciosa. Thanks for the extra information, Steven. I have tried the normal form of B menziesii, which I love but no success yet.I have to propagate from seed bexcause the plants are rarely available and am about to begin again.